From the acclaimed author of Corelli’s Mandolin, here is a sumptuous, sweeping, powerfully moving new novel about a British family whose lives and loves are indelibly shaped by the horrors of World War I and the hopes for its aftermath. In the brief golden years of the Edwardian era the McCosh sisters—Christabel, Ottilie, Rosie and Sophie—grow up in an idyllic household in the countryside south of London. On one side, their neighbors are the proper Pendennis family, recently arrived from Baltimore, whose close-in-age boys—Sidney, Albert and Ashbridge—shake their father’s hand at breakfast and address him as “sir.” On the other side is the Pitt family: a “resolutely French” mother, a former navy captain father, and two brothers, Archie and Daniel, who are clearly “going to grow up into a pair of daredevils and adventurers.” In childhood this band is inseparable, but the days of careless camaraderie are brought to an abrupt halt by the outbreak of The Great War, in which everyone will play a part. All three Pendennis brothers fight in the hellish trenches at the front; Daniel Pitt becomes an ace fighter pilot with his daredevil tendencies intact; Rosie and Ottilie McCosh volunteer in the hospitals, where women serve with as much passion and nearly as much hardship as the men at the front; Christabel McCosh becomes one of the squad of photographers sending “snaps” of their loved ones at home to the soldiers; and Sophie McCosh drives for the RAF in France. In the aftermath of the war, as “the universal joy and relief were beginning to be tempered by . . . an atmosphere of uncertainty,” everyone must contend with the modern world that is slowly emerging from the ashes of the old. A wholly immersive novel about a particular time and place, The Dust That Falls from Dreams also illuminates the timeless ways in which men and women carry profound loss alongside indelible hope. 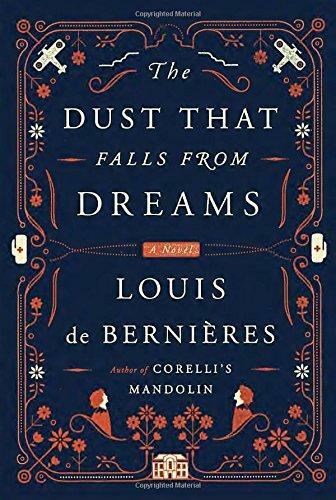 Louis de Bernières is the author of, among other novels, Corelli’s Mandolin, A Partisan’s Daughter, Birds Without Wings, The Troublesome Offspring of Cardinal Guzman, Señor Vivo and the Coca Lord and The War of Don Emmanuel’s Nether Parts. Selected by Granta as one of the twenty Best of Young British Novelists in 1993, de Bernières lives in London. The dedication of the novel mentions that this book is based on the author’s family. Does this affect your reading of the story? Why or why not? Discuss the title and its relevance to the novel as a whole. Why do you think has the author chosen brief, episodic chapters with various voices and letters rather than one continuous chronological story? Does this make the novel a more compelling story? Daniel writes: “I don’t know about you, but I think there are two ways to have come through the war. You can either let it haunt you and torment you . . . or you can be thankful for what beauty and honor came through intact and are steadily growing now that the fighting’s over” (p. 555). How do the characters’ various experiences during WWI color the rest of their lives? Who is crippled/traumatized by the war? Who is able to move on? Which characters are the most adaptable? Discuss the ideas of nobility as opposed to meritocracy in the novel. How does the war move England away from its strict class system of noble/landed families holding the wealth to a class system based more on merit and intelligence and adaptability? Describe the novel’s examination of the domestic upheavals that arrived after the war, including the rise of feminism, the decline of patriotism, the questioning of religion, and the reorientation of class structures. How does this book compare with or compliment episodes of Downton Abbey (if you have watched that PBS Masterpiece series)? The author gives vivid pictures of warfare in the trenches and in the air through Ash’s and Daniel’s stories. What type of research do you think he did to be able to paint such reconstructions of air warfare and life in the trenches? How does wartime hospital life affect and change Rosie? Or does it? How is the experience different for Sophie? How does the war and its legacy differ for males and females? What role does Archie serve in the novel? How is he a foil to Daniel? What side of English twentieth century colonialism/exploration does he represent? Compare and contrast the Reverend Captain Fairhead and the medium. How do their discussions add to your knowledge of the religious and spiritual atmosphere of England after the war? Why does Rosie become even more religious after the war? “In her room she frequently unwrapped her Madonna and child and looked into that painted face for some hint of advice or direction” (p. 360). Do you think this reaction is unusual or typical of wartime feelings? Mrs. McCosh finds solace in music. Between poetry and religion, which offers Rosie more relief and peace? What other mediums do people use to help them through tumultuous times? How is the setting, first of the English countryside and then the Sri Lankan highlands, important in this novel? Could this story take place anywhere else in the world? How and how not? How do the events of the novel this compare and contrast with what was happening in the United States at this time? Describe the role of fathers and mothers in the novel. Compare the two major mother figures in the book, Rosie’s mother and Daniel’s mother. How are they different? What is ultimately important to both of them? How are Rosie and Daniel as parents, in light or in spite of this? What does Hamilton McCosh’s conduct as a landowner, inventor, and businessman say about his character? How does it change after the war? Why does Rosie marry Daniel despite her still being in love with Ash? What is the turning point for Rosie when she finally accepts and loves Daniel? How is she finally able to move on from tragedy to love? What do you think the future holds for Daniel and Rosie, both in their relationship and in their lives? How do you imagine their story playing out? Describe the subtle use of humor in the novel. How does the author use it to point out the characters’ flaws? To lift the mood of the novel? To contrast with the horror of wartime? Discuss the four sisters and their personalities and relationships with each other and with the world at large. Do they remind you of the four sisters in Louisa May Alcott’s Little Women? In what ways are they similar/different? How does the relationship between Christabel and Gaskell play into the story? Why do you think the author included the character of Gaskell? What is Ottilie’s role in the novel? Why do you think the author chose to leave her alone at the end? De Bernières constructs a uniquely complex series of relationships in the novel. Who and what surprised you most in the story? Why did you find it surprising and what did you expect instead? What do you think of the ending of the novel?